“Run!” reads the sign, and you’d better listen. You’ll be doing plenty of that with Escape Doodland from Qubic Games on Nintendo Switch. We hope you are possessed of strong gastrointestinal fortitude because flatulence and gut grossness is your only weapon in this bizarre endless runner. With graph paper serving as the backdrop and doodles as the characters, this is one game you won’t soon forget. Players join an escape already in progress with a little purple fuzzball called Steve who journeys through various stages collecting beans and matchbooks. As he does so, he uses his own farts to aid in his escape (that’s what the matches are for—lighting farts!). As you run through the stage, you can hit a button to either jump-fart, leap forward-fart or fart in the pursuing enemy’s face to temporarily stun him. It’s such a bizarre mechanic, but it works given the context. Kids are going to love this (I thought it was pretty funny, too). Steve can also double jump and shimmy up surfaces. There’s a ton of platforming, so mastering the double jump is a must. The game is easy to pick up and play, but tough. Difficulty ramps up almost immediately and each stage has two modes—”hard” and “harder.” They’re not kidding. The game begins with Steve entering Doodland as a meteor/lightning storm erupts all around. On top of all the crazy obstacles, you’re being chased by a giant crimson fish monster whose only driving force is to make you his snack! The goal is to finish the levels while collecting beans to unlock additional stages, power-ups and characters. The first few stages take the player through several parts of a forest, complete with monsters that interact with the scenery in unique ways. For instance, one stage has a creature in the background uprooting and moving trees as you flee Omnomous, a gigantic fish beast. Later, a different background monster attacks the stage with its tentacles, effectively creating additional obstacles in the stage. Because this is an endless runner, obstacles can be a big problem. When you collide with something, it pushes you back toward the constantly pursuing fish beast. These types of obstacles can actually be used to one’s advantage to collect hard to reach beans or matchbooks. This idea of a hazard turned into a helper is a great design choice. Around stage eight, the monster becomes a green wall of death. Creepy. Of course, this leads the action into an actual toilet, so that’s something. Weirder things start happening midway through. Stage five—a glacial landscape that begins with a ghostly trip through a hollow tree, avoiding skulls with bat wings—features another monster in the background performing a similar escape. Then, a dog shows up and urinates all over the end of the stage. These little touches serve to not only demonstrate excellent stage design, but to also add an inimitable flair to the proceedings at every turn. The art style is interesting and visually engaging, featuring a wide variety of background images throughout. The stages aren’t brightly colored, but have a neat dullness to them, with some rough edges. The background is lined, appearing to take place on a piece of graph paper, giving Escape Doodland a truly unique and interesting visual aesthetic that I quite enjoyed. The character designs are wonderfully weird, reminiscent of Aaaagh! Real Monsters (especially the additional characters you can buy with beans) and other mid-‘90s style monsters.The scenery is also well done—things look like what they’re supposed to look like—but I wasn’t totally impressed with the interstitial line drawings of what appeared to be drunken doodle monsters playing video games. They are certainly cool doodles, but they lack personality. There are a few that can be unlocked throughout, but they all play roughly the same as Steve. In a cool bonus, the unlockable doodles all appear at some point during the game, running in the foreground or background of various stages. Though I liked the graphics and aesthetic, it feels busy at times. Sometimes I was so distracted by what was happening in the background that I failed a few stages. The player also seems just a bit too small, making some stages more difficult due to his diminutive size. The fish beast is given various accessories throughout—leaves in the forest stage, ice in the glacier, goggles underwater—a personal touch that only adds to the fun. The music is whimsical and up-tempo, with unique instrumentation. A kazoo gloriously sings a strong melody in one of the stages, while another level provides a symphony of creepy voices performing a dark and moody melody. I love stage three’s music with its punchy guitar theme that slowly coalesces into an atmospheric rainforest tune. This delightful composition stays with us through stage four, evoking a far away feeling of serenity and eventually distorting into the unsettling “voices-in-the-void” piece I mentioned previously. The aquatic level has appropriate twinkling music and the rest of the game follows suit, sonically speaking. With its lap steel riff and staccato bass, the pause and interstitial music is catchy and bright, playing into the game’s whimsy. It feels right at home in a cartoon setting—or dare I say it—an Earthworm Jim game. The sound effects are just hilarious. Your purple fuzz ball hilariously yells “no, no, no!” whenever the fish beast gets close and anytime the player utilizes a “fart attack” is cause for the adolescent within to convulse with fits of inappropriate laughter. It’s impossible to overstate how much I loved the music of Escape Doodland, but it is my favorite part of the game, hands-down. The manic joy of the musical themes has the potential to keep players motivated and returning for more punishment. 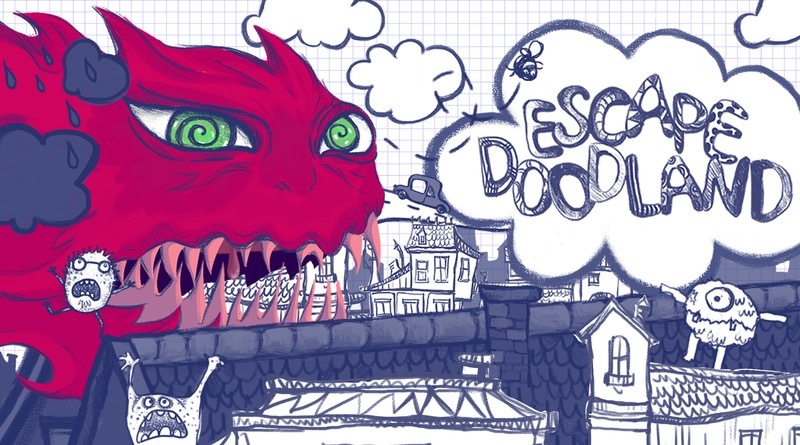 Escape Doodland is fast and frustrating, but a fun game to play when you want to blow off some steam or listen to some killer tunes. It features unique visuals and plays on the disgusting side of things (like farts) so it may not appeal to a wide audience.